Arrive at Maun Airport, where you will clear customs and immigration and collect your luggage. You will be met in the Arrivals Hall by a representative of Safari Air for your charter flight into Okuti Camp, 25 minutes away, across the Okavango Delta - one of the most amazing sights you will ever see. Okuti Camp is positioned under large trees at the edge of the Xakanaxa lagoon within the Moremi Game Reserve, and within close range of shallow flood plains, papyrus swamp and dense riverine forest. 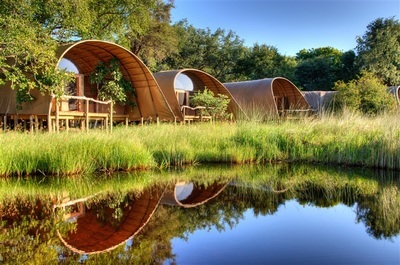 It is a small and private camp catering for a maximum of 20 guests, accommodated in insect-proofed units built on wooden platforms with en-suite bathrooms. Each of the units is positioned to overlook one of the Delta's famous lagoons, so that guests may enjoy the splendour of the African sunset. A lounge, dining area and swimming pool complete the picture. Your first game-viewing activity will commence this afternoon. 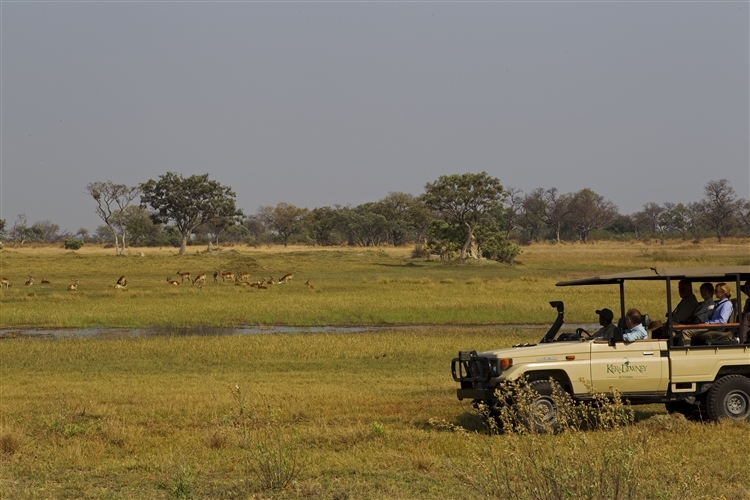 Activities include safari game viewing in open 4x4 vehicles into the Moremi Game Reserve, and motorized boat trips through the myriad twisting channels of the famous Okavango Delta. Elephant, Buffalo, Lion, Leopard, Cheetah, Wild Dog, Hyena, Giraffe, Hippo, Sable Antelope, Wildebeest, Kudu, Lechwe, Sitatunga and many more predator and antelope are resident. Okuti is one of the few Botswana lodges that can offer all year round boating trips, as well as extensive 4x4 drives into outstanding game country. The Moremi Reserve is rated as one of Africa's finest game-viewing areas, offering sanctuary to abundant herds. Birding is quite spectacular, especially during spring and summer when the migrants breed. Huge numbers of breeding storks and herons are attracted to the world-famous heronries which lies to the north of the lodge. Nature walks on nearby islands. Guests are offered two activities of their choice per day. Daily camp activities follow a rhythmic pattern in harmony with that of the nature that surrounds the lodge generally you will enjoy a light breakfast of coffee, tea, fruit juices, cereals, muffins and fresh fruit, just before dawn and then set off on extensive safari drives, or boat outings. Upon your return to camp three or 4 hours later it's time for a full breakfast followed by lunch or alternatively, especially in the winter months, these are combined into a scrumptious brunch. A siesta is followed by high tea before you will set off again on a safari activity that returns to camp about half an hour after sunset. After an early morning activity of your choice and brunch, you will depart Camp Okuti, flying to Kanana airstrip, across the Okavango Delta, 20 minutes away. 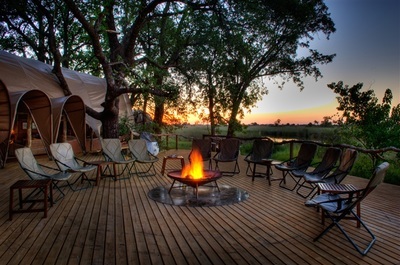 Situated in the centre of Botswana's Okavango Delta, Kanana Camp nestles among towering jackalberry (ebony) trees, knobthorn acacias and sausage trees on the edge of a permanent stretch of channel. Kanana Camp itself has been beautifully designed with the main lounge and dining area raised on decks and forming a massive circle. This flowing main area is split into three sections: there are two comfortable seating areas, each with squishy sofas and a selection of coffee-table books. One of these incorporates the bar, which is really simply a sideboard containing a selection of spirits and wines, and a wooden cupboard housing a large fridge. The third part of this decking is a dining area; home to a long dining table where everybody normally eats together, a tea station and a separate table for serving. 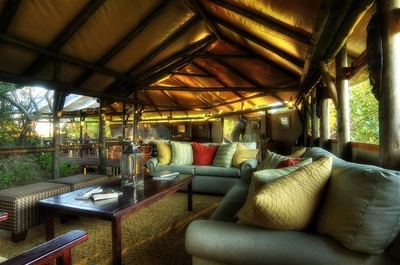 The tented chalets at Kanana Camp are reached along elephant dung pathways (this is much nicer than it sounds! ), and are spread out; each overlooks the channel in front of camp, and are structured tents on raised wooden decks they have a solid frame made of thick wooden beams, around which the thick canvas of the tent is stretched. 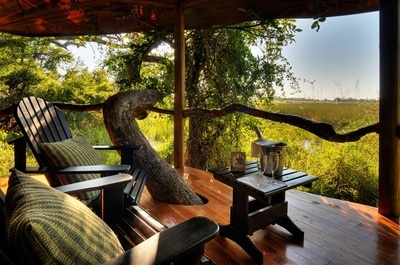 Each tented chalet has its own shaded veranda at the front, where two comfortable wooden chairs face onto the waterway and floodplains in front of camp. Your first game-viewing experience will commence in the afternoon. Activities at Kanana include game drives, night safaris, mokoro trips and sometimes motorboat excursions. 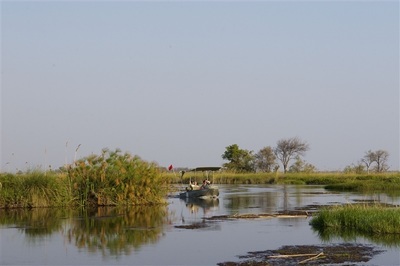 Kanana has some very experienced mokoro (dug-out canoe) polers and a wide variety of channels and open lakes to explore. You can also take a rod out and try your hand at fishing if you like! Adjacent to Moremi Reserve, Kanana's environment is a mix of forests and open plains, combined with permanent channels and lush flood meadows. Lion and leopard are common, as are herds of elephant in the dry season, and several glades of tall acacia trees encourage graceful giraffe to stay in the vicinity. Kanana Camp one of the Okavango Delta's best camps for bird-watchers. Expect clouds of open-billed storks, the Okavango's only known breeding site for pink-backed pelicans, together with large concentrations of yellow-billed and marabou storks, grey herons, ibises and assorted egrets. These attract predatory fish eagles and crocodiles creating a remarkable birding spectacle. Kanana camp offers bush walks with an experienced and armed guide for those guests who wish to get a little closer to nature. Usually taken in the morning (when it's cooler), these walks follow old hippo-paths through the bush and aim to give guests a deeper understanding of their environment. 'Kanana' means paradise in Setswana, and the camp certainly lives up to its name. After your morning activity and brunch, you will charter from Kanana Camp back to Maun Airport (20 minutes), in time for your onward arrangements.